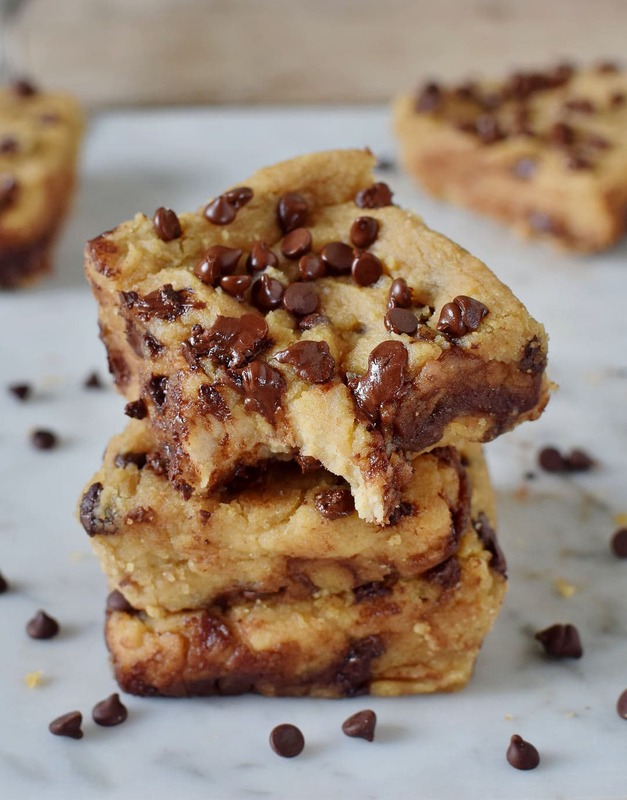 Oh my, oh my… these chocolate chip blondies turned out better than expected. So gooey, soft, chewy, fudgy, moist, and delicious. If you don’t want to try them after seeing these photos and the video (see below), then why are you even here?! Just kidding, lol. But seriously, you have to give these bad guys a try, you HAVE! Because they might become your favorite dessert, ever. I always thought brownies are my weakness but now I am not sure anymore and this scares me a bit! 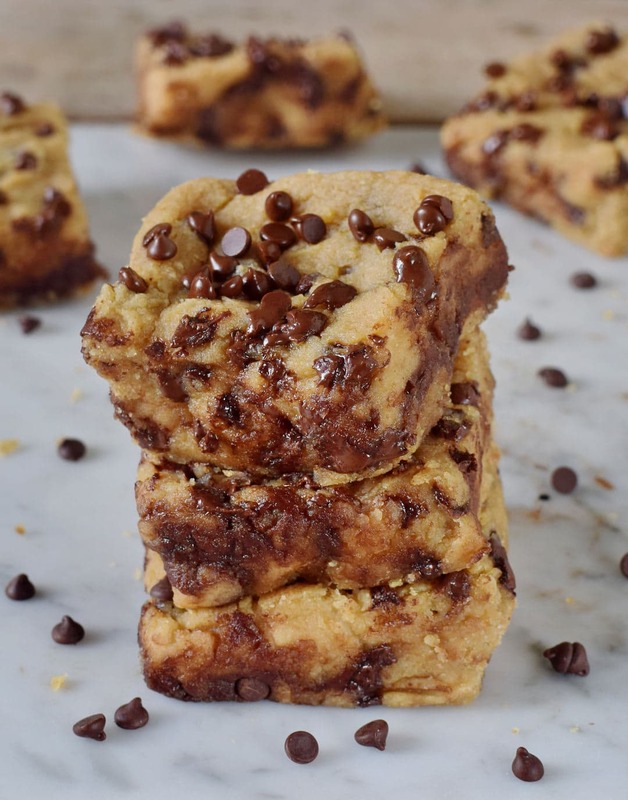 Are you ready for these gluten-free, grain-free, vegan blondies?! Like I said before, in a couple of my blog post, I LOVE brownies, I really do. You can see some of my favorite brownie recipes here. 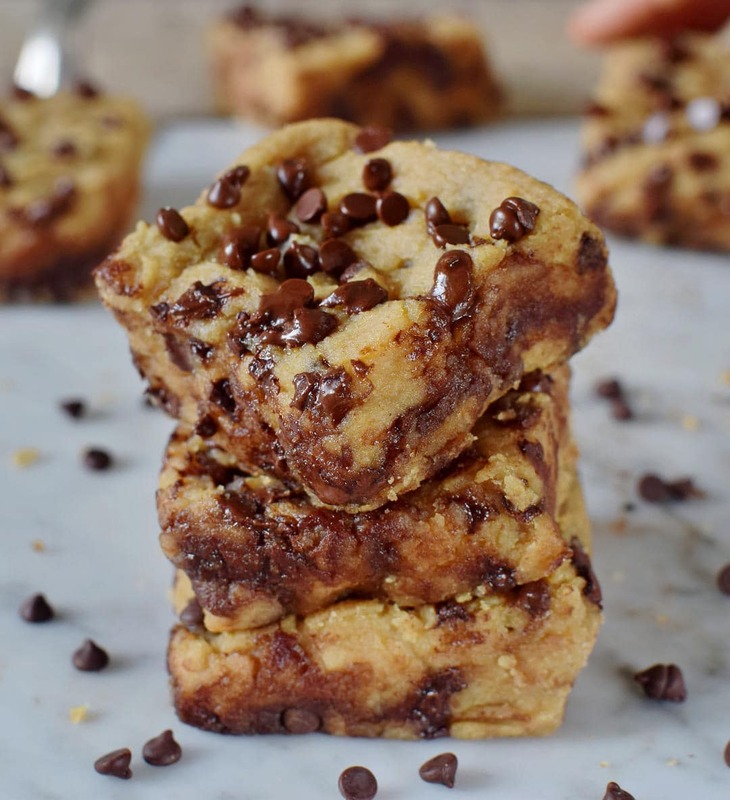 However, these chocolate chip blondies are killing me (in a good way). They are so rich and gooey and it’s hard to stop eating them. The best advice I can give you is this. Make a double batch and freeze leftovers. It’s pretty convenient to have them sitting in the freezer, especially on days when you crave them so badly. Yes, here we have it again. A dessert recipe made with chickpeas. 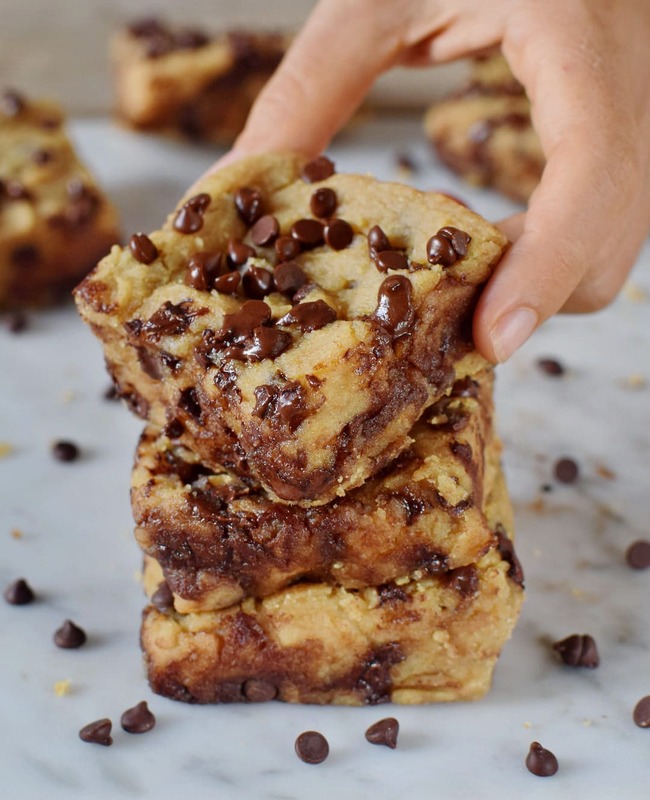 I really love how my Flourless Brownies turned out and since they contain chickpeas I thought it would be smart to also add them to these chocolate chip blondies. Chickpeas are rich in protein, fiber, minerals, and vitamins. And isn’t it amazing to eat healthy desserts? I used almond flour (which contains 100% finely ground almonds) as flour and it makes the recipe gluten-free and grain-free. These blondie bars also contain ground flax seeds! Flax meal acts as an egg replacement, however, it also contains lots of fiber and healthy ALA (alpha linoleic acid). Instead of almond flour (ground almonds), you can use any ground nuts of choice, for example, hazelnuts. To make the recipe nut-free I would recommend using ground coconut flakes (unsweetened shredded coconut). Please do not use coconut flour because it contains less fat and it absorbs a lot of liquid. 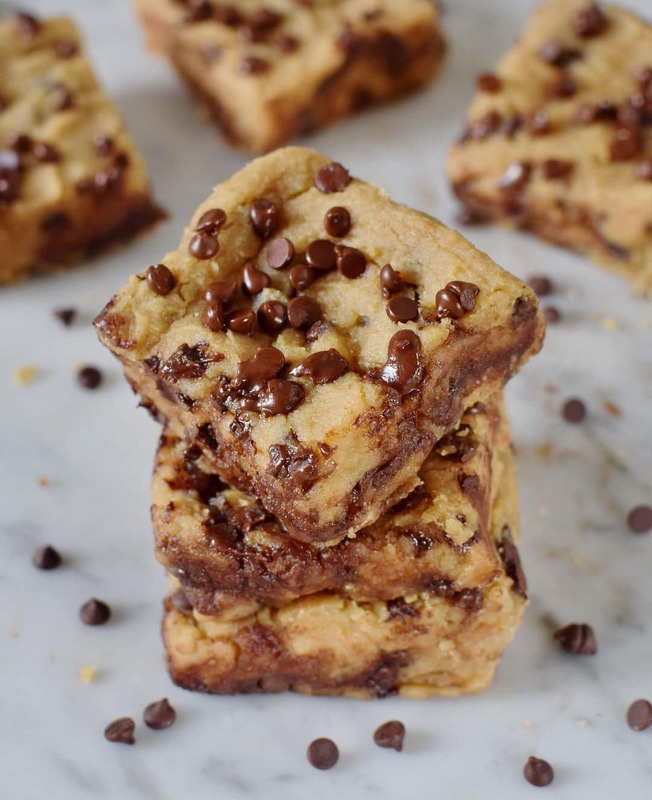 I used mini chocolate chips for these easy to make blondie bars. 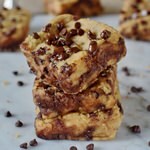 You could also use dairy-free chocolate chunks or a combination of chocolate chips and chocolate chunks. Whatever you prefer, it’s your choice! This recipe is seriously easy to make. All you need is some ingredients (which you maybe already have in your pantry) and either a food processor or a blender. I used a food processor and it worked like a charm. But feel free to use a blender instead. Watch the short video below to see how easy it is to make these healthy vegan blondies! 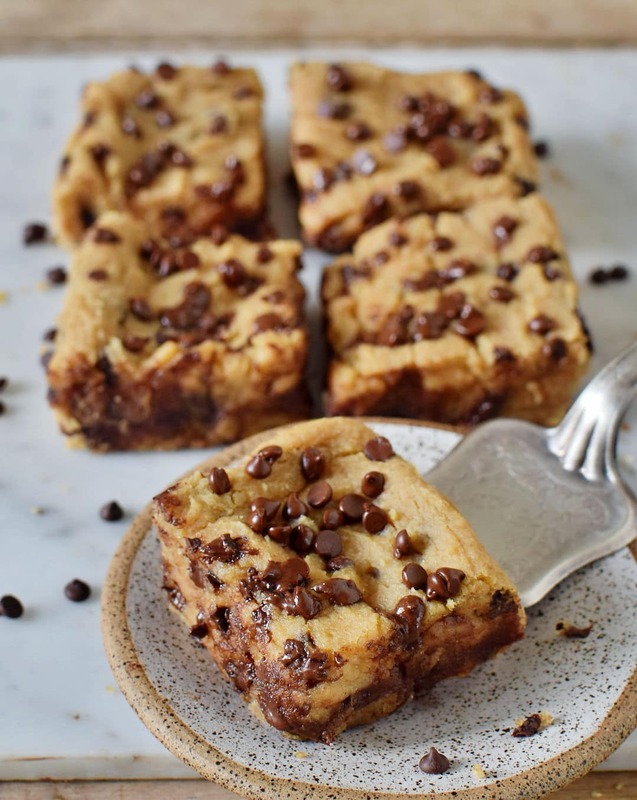 Should you recreate these delicious chocolate chip blondies, please leave a comment below and don’t forget to tag me in your Instagram or Facebook post with @elavegan and #elavegan because I love to see your recreations. 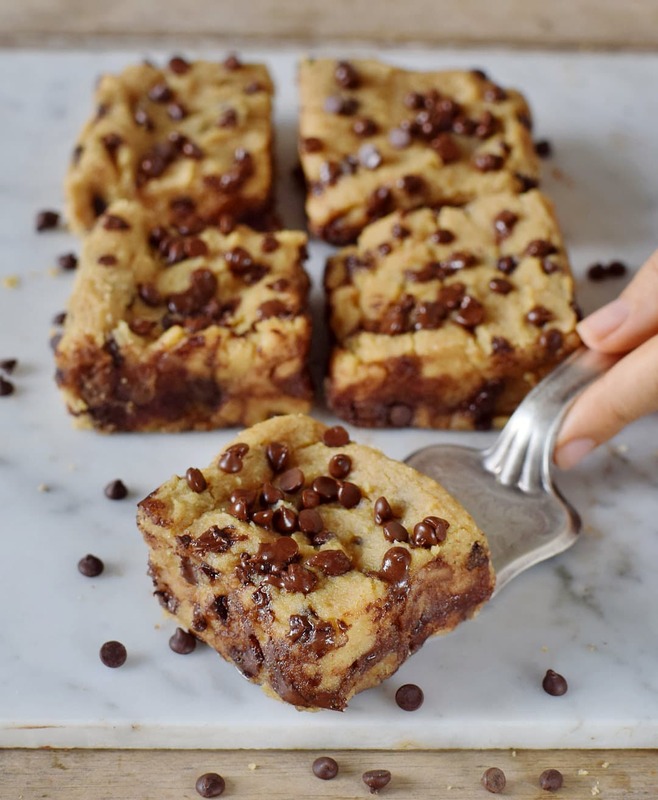 These easy to make vegan blondies are so gooey, soft, fudgy, moist, rich, and yummy! The recipe is gluten-free, grain-free, oil-free, protein-rich, healthy and can be made nut-free! Put all wet ingredients into a food processor or blender and mix until smooth. Add all dry ingredients (except chocolate chips) and mix again. Now add the chocolate chips and stir with a spoon. Spoon the batter into a lined baking pan. My baking dish measures 9"x6" (23 x 15 cm). Top with more chocolate chips or chocolate chunks. Bake in the oven for about 25-30 minutes (it can take some minutes more or less, depending on your oven and the size of your baking dish). I have a gas oven and baked them for about 27 minutes and they were still a bit underbaked (which I love though!). Let cool and cut into bars. They will be still soft at first but firm up more once cooled down. Enjoy! You can use any ground nuts instead of almond flour. For a nut-free version try ground hemp seeds or ground shredded unsweetened coconut. I wouldn't recommend coconut flour since it contains less fat than almond flour and furthermore absorbs a lot of liquid. Any nut butter like peanut butter, cashew butter works fine. For a nut-free version use coconut butter. I wouldn't recommend sunflower seed butter as it will turn the blondies green unless you leave out the baking powder and baking soda (don't ask me how I know, haha). My son cannot have flax. Would I use eggs instead? And if so, how many? You can use ground chia seeds instead. I wouldn’t recommend eggs as they don’t contain fiber and the batter will be too thin. I’m jot concerned with gluten myself, can I use regular flour over almond flour? I wouldn’t do that because regular flour doesn’t contain any fat. Almond flour is 100% ground almonds. You can try it, of course, but the result will be different. Can I use gluten free all purpose flour? I don’t have almond flour. No, as it doesn’t contain any fat. Almond flour = 100% ground almonds. You can also use any other ground nuts of choice. Hi Ela, can I use coconut powder instead or just process almonds if I don’t have almond flour? These are so delicious! And easy to make! Thank you, Ela! Can the xylitol be substituted with honey, maple syrup or molasses? Or any other liquid sweetener? I will definitely make two batches, one of them with maple syrup and less milk. Let’s see how it turns out. Thanks for the recipe!!! Chick peas are to fibrous for me and I can’t eat them is there a substitute? could i use oat flour? or a nut free flour and add more liquid? Ela, these are delicious. I used coconut sugar and a combination of all-purpose and walnut flour. Thanks for the recipe! 1. Can I use skim or full cream milk instead of plant based milk? Same quantity? 2. Can I use unsalted butter or salted butter instead of nut butter? Same quantity? Should it be melted of softened? If not nut butter, would you recommend any oil instead? Hey Joan, I am sorry but I am not allowed to advise you what to eat to gain weight since I am not a dietitian, nutritionist or doctor. Furthermore, it can have different causes if you can’t gain weight (e.g. gut problems etc) so I would recommend to talk to a specialist. Ela this is hands down the best recipe I’ve followed in YEARS! I have to admit I was skeptical about using chickpeas in baking as I’ve never been a fan of black bean brownies and thought they might be dry but I couldn’t have been more wrong. The texture is just perfect and they were so easy to make that I think they’re going to become a staple in our house. Thanks for creating the recipe!! Thank you very much for your feedback, Grace! It makes me so happy that you liked these chickpea blondies even though you were skeptical at first. Awesome! This receipe is awsome, it’s such a great idea to use chickpeas as they are undetectable. Thank you for Théo great discovery! These were phenomenal!!! For sweetener, are used 1/3 brown sugar, 1/3 coconut sugar, 1/3 maple syrup. I added 2 tablespoons of spelt flour to make up for the extra liquid, although I think it would’ve been fine with out. The flavor is incredible, and the Allman flour thickens up beautifully. Thank you so much for such a fantastic, well balanced recipe. I haven’t tried these yet, but the recipe says to line the baking pan, so I was just wondering if you liked it with parchment paper or something else? Yes, parchment paper. You can also see it in the video right above the recipe. I made these today and they were so good! I didn’t have a blender or food processor so I used a fork to mash the beans and the rest of the ingredients. Took a few minutes but well worth it! I also used egg replacer equal to 1 egg and added about 1/8 cup more almond flour. I will be making this recipe again, that’s for sure! YUM. I’m making a second round tonight after eating the whole batch in 2 days (surprised they lasted that long actually). I forgot to buy more almonds, so I made it with 1/2 cup + 1/8 of regular flour and the other 1/8 cup with olive oil to add more fat (that the almonds would give). Also used brown sugar because I didn’t have xylitol. They turned out really good with the substitutions!! I honestly think they taste even better the second day. Thanks for this recipe, it’s delicious! These look amazing! Definitely a must try! ???? These are delicious! So soft and yummy. Chickpeas are a really interesting twist. I used coconut sugar in place of the xylitol and chocolate chunks. Did anybody try it without the baking powder and soda? I try my not to use them much? I have to admit that I was skeptical at first about the chickpeas in a dessert, but those looked so good I just HAD to give them a try. I followed the exact instructions of the recipe but I sadly have to say that I did not like them that much because of the chickpea flavour. However I expected that u wouldn’t taste them but unfortunately u do. I highly recommend using a loooooot of chocalate chips so that u won’t taste the chickpeas! Thank u anyways. I love this recipe! I ate it all in one day (with a little help). Love the use of chickpeas for protein. I used monk fruit seeetener instead of xylitol and they came out so good! They def firm up once cooled. They were so good I ate the first third before they cooled and it was yummy that way too. These turned out so good, couldn’t stop myself from eating them! Made these for Valentines day for my coworkers (one is lactose intolerant, and another is celiac & I am *mostly* vegan haha). They were DELICIOUS! I did sub ground chia seeds for ground flax as my stash of ground flax had gone bad … oops lol I also dyed them pink with some pink food dye which looked GORGEOUS. Oh and I used 1/4 cup golden sugar and 1/4 cup cut stevia. Highly recommend this recipe, very adaptable and easy. Thanks Ela! Bonjour ! Ces blondies ont l’air délicieux ! Je voulais savoir si je peux obtenir un résultat similaire avec de la farine tout usage de blé ? Cela ne me gêne pas si ce n’est pas sans gluten. De plus, la farine d’amande est assez onéreuse… J’attends ta réponse avant d’essayer cette recette très appétissante ! Hey, I don’t think the result would be as good because almond flour contains 55% fat and regular wheat flour contains zero fat. The recipe is oil-free, the only fat comes from the almond flour. So if you replace it with regular flour, the blondies will turn out rather dry and not moist. I wouldn’t recommend it. OMG!!! I made these on two occasions and my friends and family Loved loved loved them. They are so moist and delicious. Mine took to long to bake did I do something wrong? I don’t know, unfortunately. Did you use all ingredients as indicated in the recipe? These look amazing. Do you know the nutritional information on these? So tasty and healthy! I use to make this together with banana bread. My family loves it, and it ends quickly.